Ah, thrift store shopping. My heart literally flutters with anticipation as I walk through the doors of a secondhand shop. Silly, I know. But I feel ecstatic and at home in a thrift store. It’s something I prefer to do alone, no kids, no hubby. Just me, hunting for treasure in my own time. There is no corner left unturned. I leave, happy to bring a bit of unknown history into my own home. It is a confirmation for me that our life stories are all built upon each other, from one generation to the next. There is a newer thrift store in town that I’d been meaning to get to – and so glad I did. I came home with bags of new-to-me goodies, some destined to stay as they are, and others that will be reborn – to begin a new life story. I want to show off my weekend finds – and perhaps even get your opinion on a couple of them. Have a seat in my blue velvet chair, and enjoy the show. I have an idea for an art piece to go in our dining room…just need to find the time and gather all the pieces. 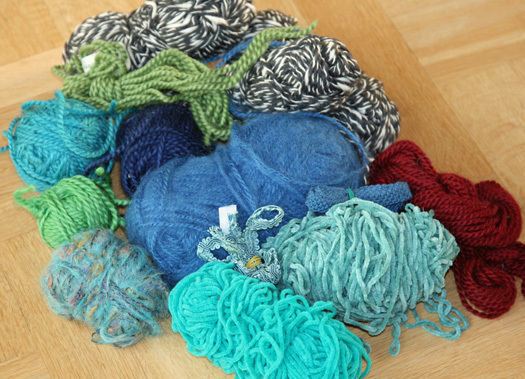 A hint…I need thin strips of different paper designs (I’m going to use wallpaper), and colored fibers (yarns and such). This is a good start on the fibers. I’ve already started a wall piece to go over our bed in our now-underway bedroom remodel project. 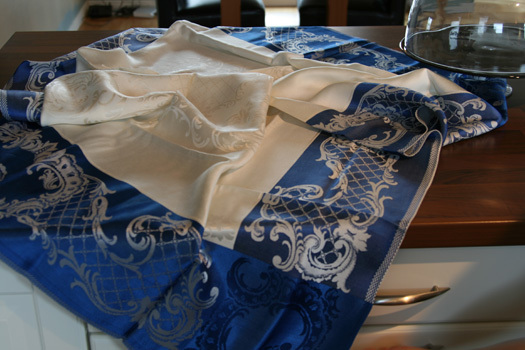 It requires fine fabrics like velvets and silks. 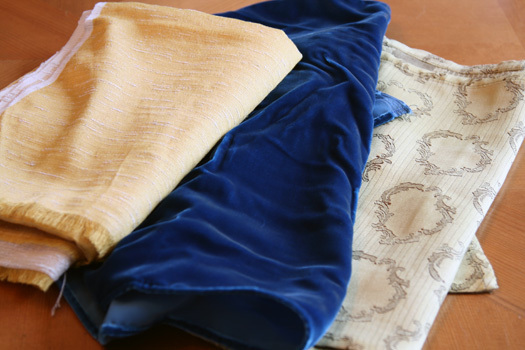 These additions to my fabric selection make me feel happy just touching them as they are. Good fabric should make you feel happy! What a steal! 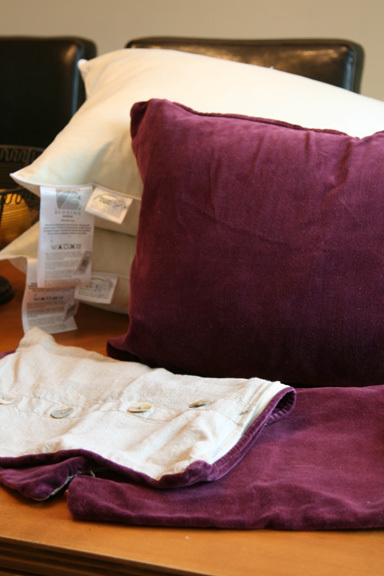 Purple velvet pillow cases, linen on the backside, and new pillows to boot! All thrift store, about $6 each including feather pillows! The front of these pillows are just screaming my name for some embellishment attention. 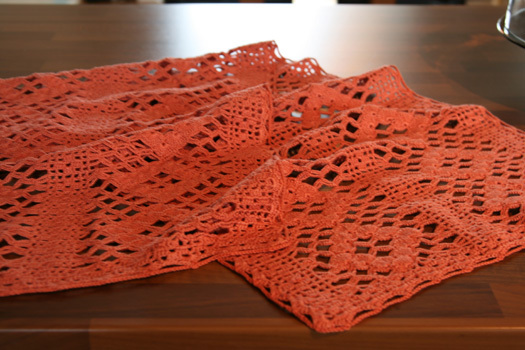 I love the color of this orange knit (is that the right term?) runner. 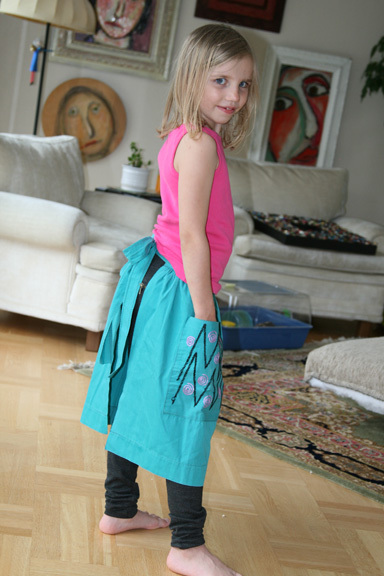 It’s going to get a new life as a skirt for my daughter. ‘A ribbon runs through it’ and it will be nearly done! 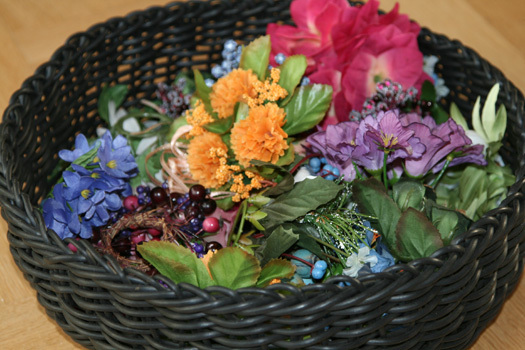 Not only did I get this fabulous black round basket, I also carefully picked through a box of these flower rings to find the most colorful selection of ‘soon-to-be door wreath happiness’. 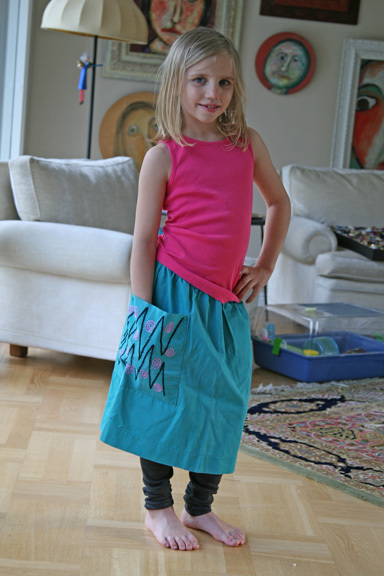 …as a summer dress for my daugther. 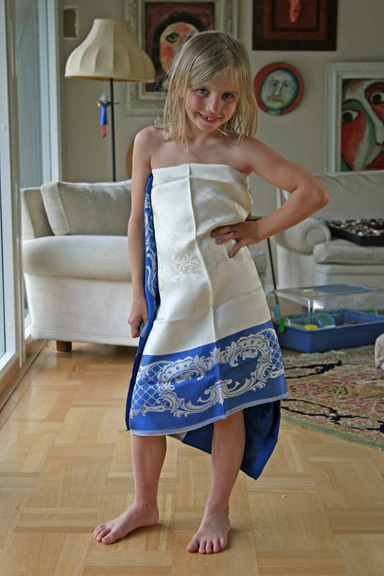 No…this isn’t the dress, it’s just wrapped around my little poser. Given my wannabee sewing abilities, I’ll try this like a pillowcase dress and see what happens. No bottom seams needed as the edges of this material are finished off perfectly as they are. I picked up this vintage adult apron…it will get a new life on the front of a dress or skirt for Mia. About $1.50. 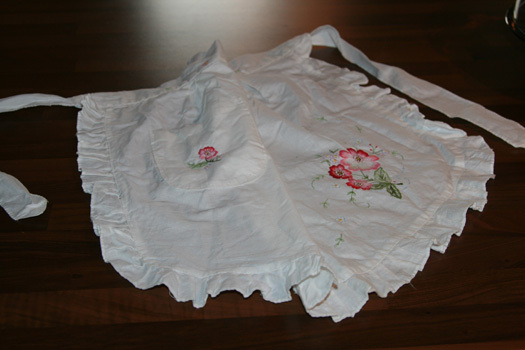 And this vintage apron is staying as it is…and becoming a skirt for little Mia. No sewing necessary! I think it is perfect as it is! An instant color punch and trend-setter for under $3. Yes, we’ll leave the back open…that’s what leggings are for! I think she looks divine. Thrift stores over here result in the most fascinating antique finds – embracing the old is relatively new over here in Sweden as everyone has been on the modern design train for quite some time. But thrift stores are coming back in fashion – so it will be harder to find these gems going forward. 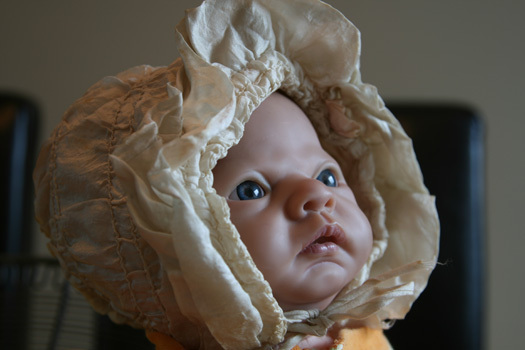 I picked up this (really) vintage silk baby bonnet for about $1.75. 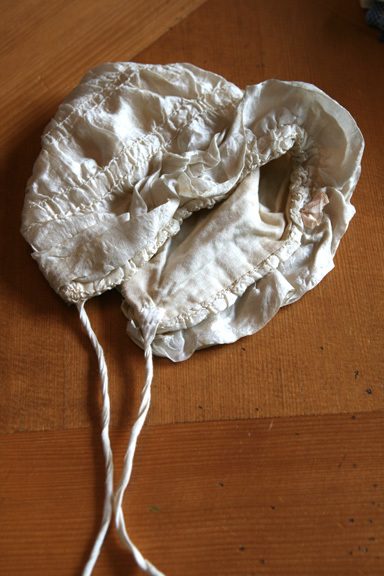 I can tell it’s super old by the inside lining…and the pale pink rosette on the front side (you can barely see it on the right side). I put it on Mia’s baby doll (the one that freaks me out sometimes because it looks so real) so you could see how absolutely adorable this is. There will be no more babies for us…so Mia gets to use this with her dolls – and maybe her own babies in the future. What are these, you ask? 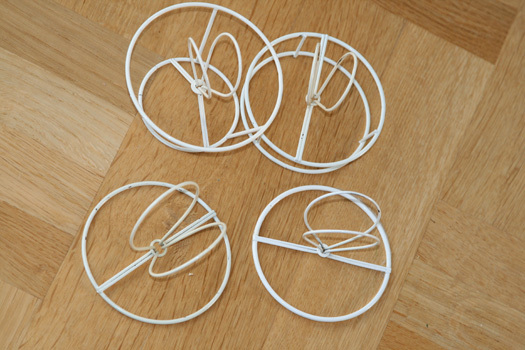 These are the frames for some new funky clothes (lampshades) for LuLu, my renovated chandelier. She’s currently wearing her original silk clothes from days of old, and I’ve been thinking about making a set of funky ‘play clothes’ for her to shake it up a bit. Any ideas of what I can do with these? I need a punch of color in a teal-gray and beige color scheme. I LOVE the shape of this vase! Classic and elegant. Now I’m torn. Do I paint it cream white? Or do I mosaic it with broken tiles? It also might become the new home of a larger bunch of button flowers. What do you think? I don’t know why, but good mirrors are hard to find. That’s why my heart skipped a beat when I spied this one leaning against a back wall in the thrift shop. What? $15 and no one has taken it? My initial idea was to mosaic it. But I am actually liking the red color (which is a shade darker than in this flash photo). It will be lifted several inches and hung on the wall. And we are thinking of painting the buffet a cream white color – and giving it a good sanding on the edges so the dark will show through. 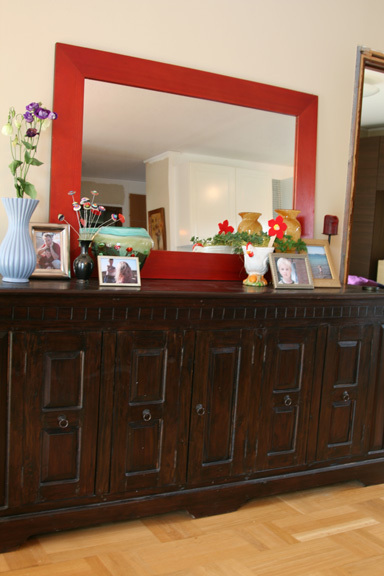 Vote on the mirror – leave it red, paint it cream to match the buffet, or mosaic it? Back in March I posted about my button fetish, and if you were paying attention you’ll remember that I also mentioned dishes in that same line. 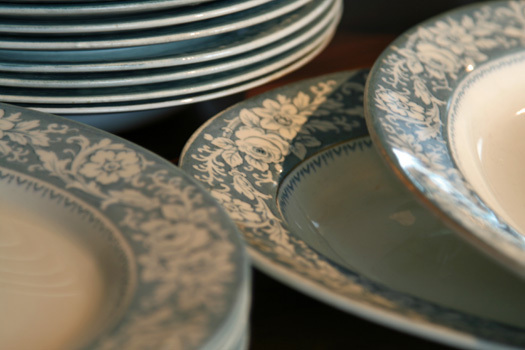 I just could not say no to this beautifully less-than-perfect set of vintage dishes. 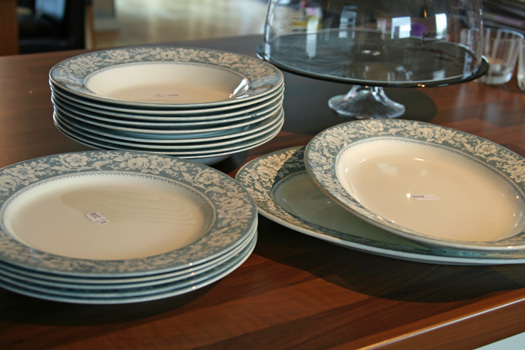 5 plates, 9 bowls, and 2 serving plates. What more could one ask for? $15. 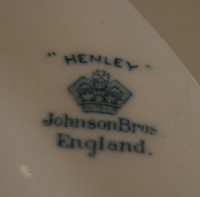 Here’s the stamp on the back of the dishes. Don’t know if there is any value…don’t care. They are priceless for me. And the piece de resistance for my weekend thrift? This absolutely fabulous set of antique bottles…complete with a story from the Swedish elderly couple in line behind me. They said that they remembered carrying milk to school in these. They originally held bubbly water, but then the families would use them for the kid’s lunch drink (milk). Both they and the lady behind the counter told me they should be anywhere from 70-100 years old. What perfect timing that they would be there to tell me the history of these beauties. It makes me feel even more connected to them and their story. And several of them still have their original seals in tact. $12 for all of them. I think they are absolutely beautiful. 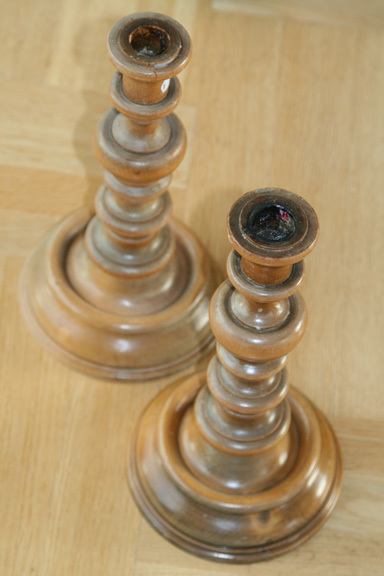 And they will repurpose to stand proudly as the most lovely set of flower vases on the table this summer! There you have it. God bless the thrift store! @Anonymous – Those paintings on the wall behind my daughter are from my favorite artist, who has unfortunately passed away. His name was John Steinberger – from Independence, Kansas, and his work really captured me. As it turns out I was able to obtain several pieces from him over the years – and even though the entire world didn't know it, they really lost a creative soul when he left. Even though you didn't speak of them in this blog…I absolutely love the art work hanging on your walls (behind your daughter in the tablecloth pic). Yours??? I'm new to your blog, but having so much fun reading it. 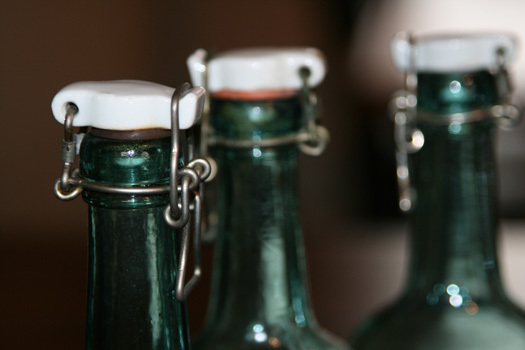 Those milk bottles are gorgeous and such a great price. Aren't thrift stores great? And your daughter is so lovely. She will look adorable in her little skirt and dresses. I vote red for the mirror, it will add to the wonderful splashes of color in your house. I think you should make a duve cover out of the table cloth! I love seeing all of these fabulous finds. Great stuff! The mirror is a great find. 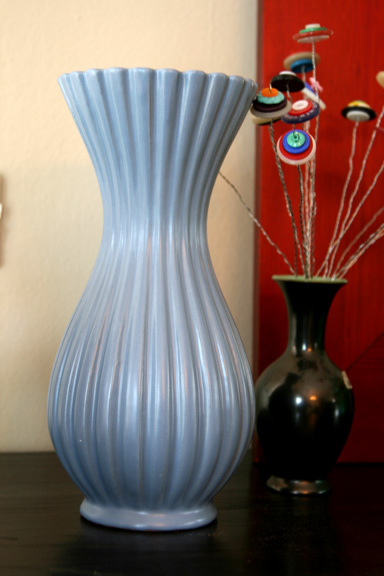 Keep the vase blue!!! It's so cool! I vote for keeping the mirror red and maybe just "distressing" it with a bit of the creme paint to tie it together? You're way more creative than me, but I LOVE this post! 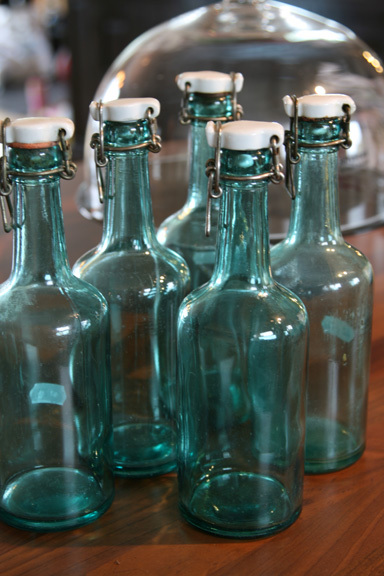 You found soooo many "cool" treasures…I think my favorite is those awesome bottles. Thanks so much for to my NTT party.